Reducing the complexity of virus production we divide the cell into three compartments: the extracellular matrix (all quantities with the index ext), the cytoplasm (cyt) and the nucleus (nuc). Four plasmids are transfected - the plasmid coding for the helper proteins (helper), the gene of interest (goi) and two types of plasmids coding for the capsid proteins (capwt [wild type], capmod [modified]). The plasmids are transported into the nucleus where gene expression is initiated. Processed mRNA is transported into the cytoplasm and proteins (phelper, pcapwt, pcapmod) are produced. Containing a nuclear localization sequence proteins are relocated into the nucleus where capsid assembly occurs. The viral capsid is composed of 60 subunits of viral coat proteins. Titration of the two plasmids coding for the capsid proteins leads to virus surfaces with different ratios of wild type and modified capsid proteins. 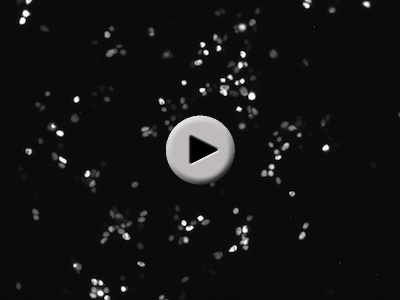 The gene of interest is replicated by cellular polymerases and single stranded DNA (ssDNA) is encapsidated into the preformed capsids (capsid) forming infectious viral particles (V). Finally the recombinant viruses are released into the extracellular matrix and can be harvested for transduction. 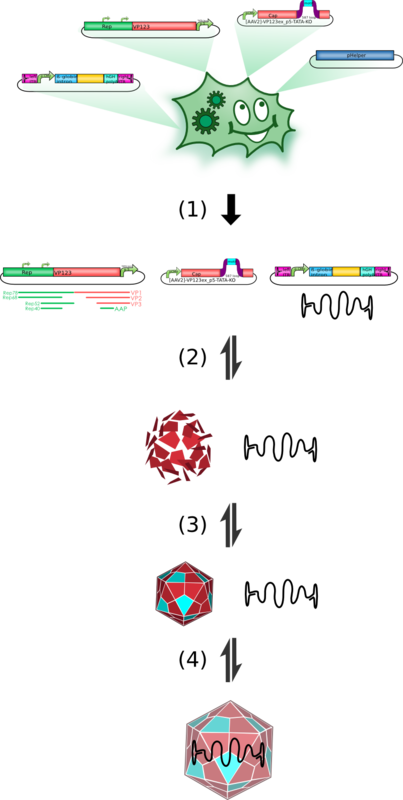 Figure 1: Schematic overview of virus production: A production cell line is transfected with 4 plasmid types. DNA is replicated, transcribed (1) and proteins are synthesized (2). 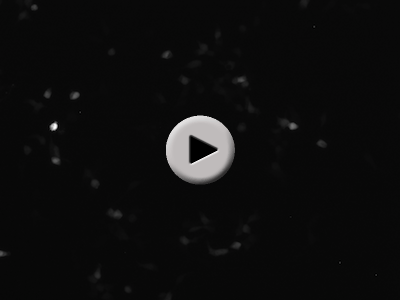 Capsid assembly occurs (3) and single-stranded DNA is packaged into the viral particle (4). Even the coarse model for virus production described in the previous paragraph would still consist of 24 ODEs containing 39 parameters (35 rate constants and 4 initial plasmid concentrations). Taking into account the linearity of the law of mass action (LMA) for simple transport processes we can neglect these fast reactions and therefore reduce the model to the rate limiting steps like protein synthetization, capsid formation and virus packaging. 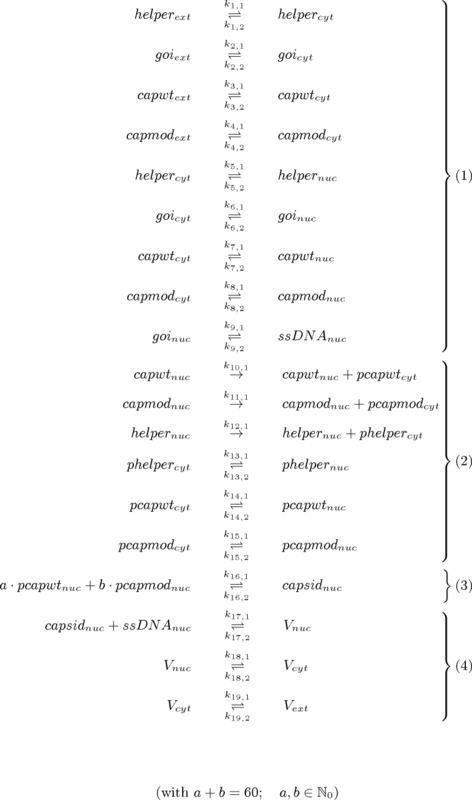 The 13 reactions for the virus production are represented in a system of 17 coupled ODEs. 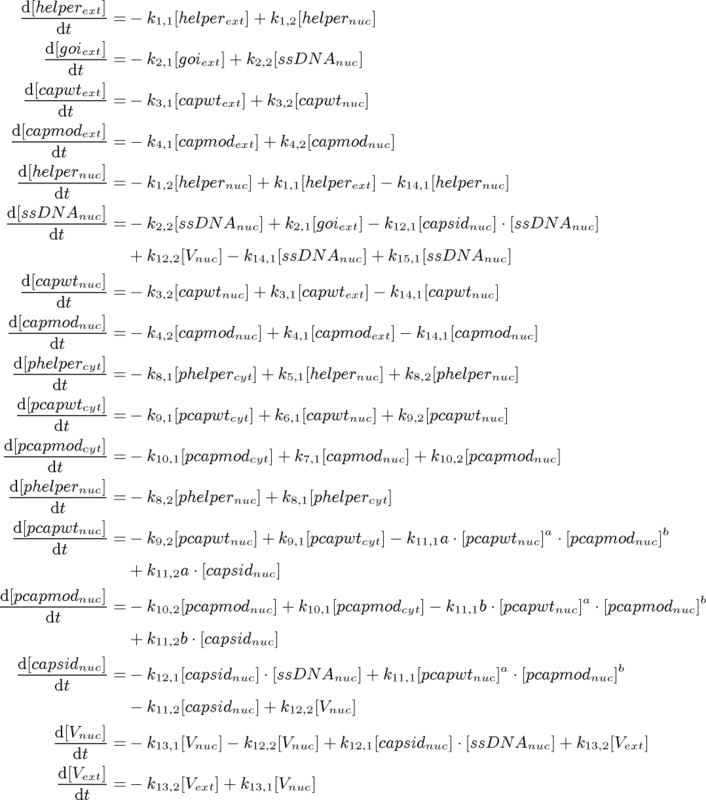 The ODE model was implemented in MathWorks® MATLAB R2010b. Integration of the differential equations was achieved using the stiff integrator ode15s with automatic integration step size management. 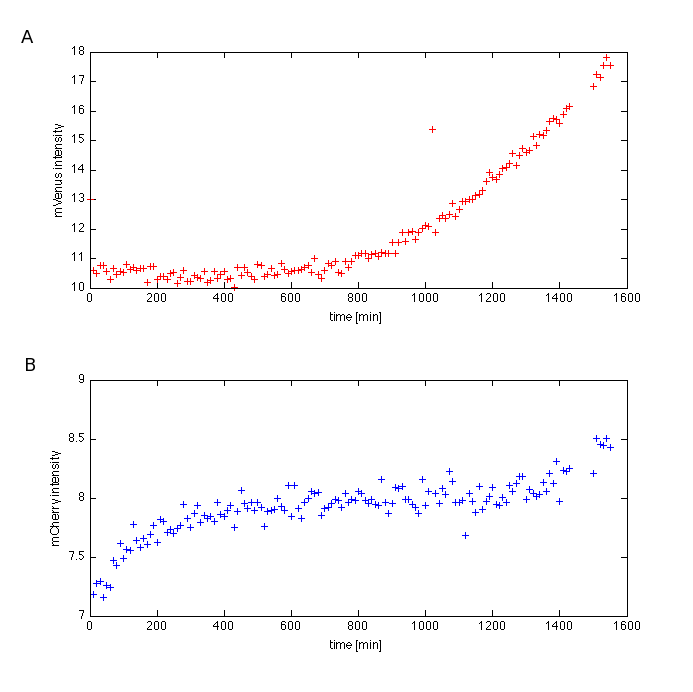 In order to adjust the dynamical model to biological data we extracted the average intensity out of the time lapse recordings of fluorescence experiments as well as published values for the rate constants. For initial conditions we took the plasmid concentrations we used in experiments. Figure 2: Fluorescence microscopy of transfected cells. mVenus is included to the modified capsid plasmid i.e. fluorescence intensity reflects capsid protein concentration. The image on the left shows one snapshot out of the time lapse recorded over a period of 1560 minutes (26 hours) after transfection. The bright spots correspond to the fluorescence intensity of mVenus in the upper and of mCherry in the lower picture. To see the whole time lapse as an animation just click on the picture! Figure 3: Fluorescence microscopy of transfected cells. Viral particles containing mCherry as gene of interest are visible. Figure 4: A shows the average intensity of mCherry recorded using fluorescence microscopy. The curve corresponds to the rising phase of protein concentration and is expected to saturate for longer times as the harvest of viral particles is done after 3 days (4320min). B: time course of the intensity of mCherry. Due to the weak expression of mCherry the signal to noise ratio is quiet low and the functional dependency is not clearly determinable. The average intensity was extracted from the raw data uisng a script written in MathWorks® MATLAB which sums up the intensity value of each pixel of one image. Download the m-File (MATLAB source code). 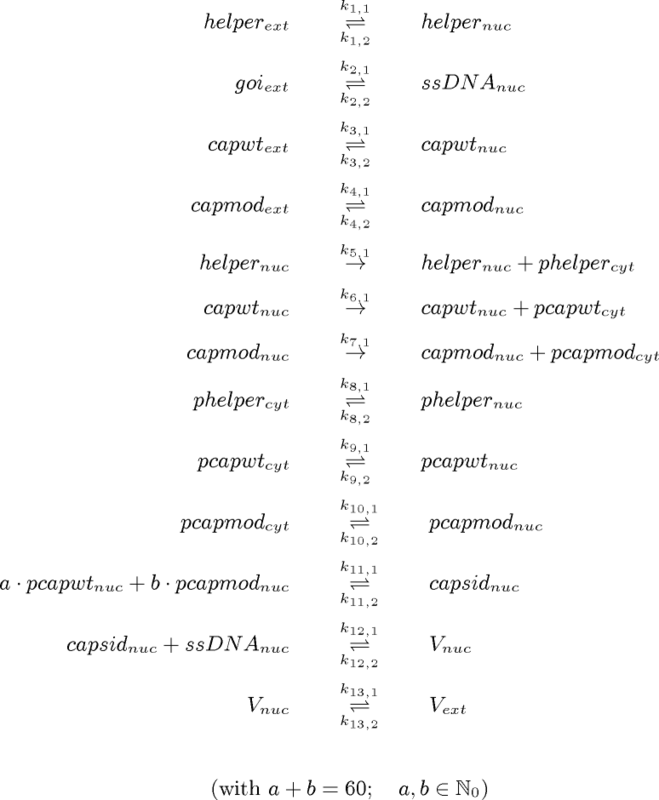 The used model parameters are given in the table below. 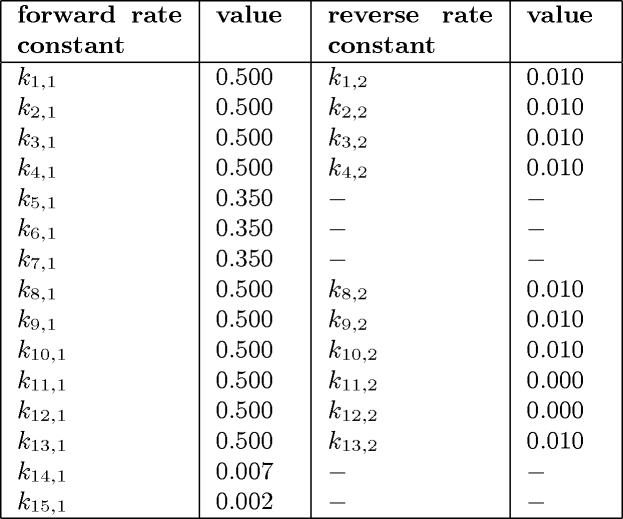 Table 1: Rate constants for the virus production model. Generally forward reactions were assumed to be faster than reverse ones. Replication of ssDNA is slower than its degradation. 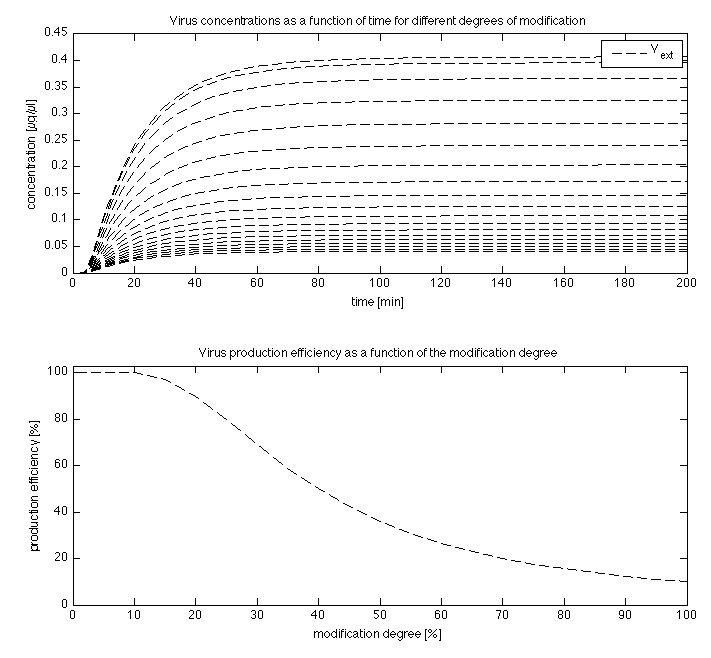 Figure 5 shows the time course of the model for virus production. The initial plasmid concentrations were chosen to 20µM for the helper, goi, and capsid-wt plasmids and 10µM of the modified capsid plasmid. After the short peaks of the intranuclear plamid concentrations proteins are synthesized and capsids are formed. The ssDNA enters the capsid through a pore and infectious virus particles are reseased to the cytoplasm from where they are transported out of the cell. The concentrations reach a steady state as a result of ssDNA degradation inside the nucleus. A model extension was made taking into account the production efficiency dependend on the level of modfication. The resulting curves are plotted in figure 6. 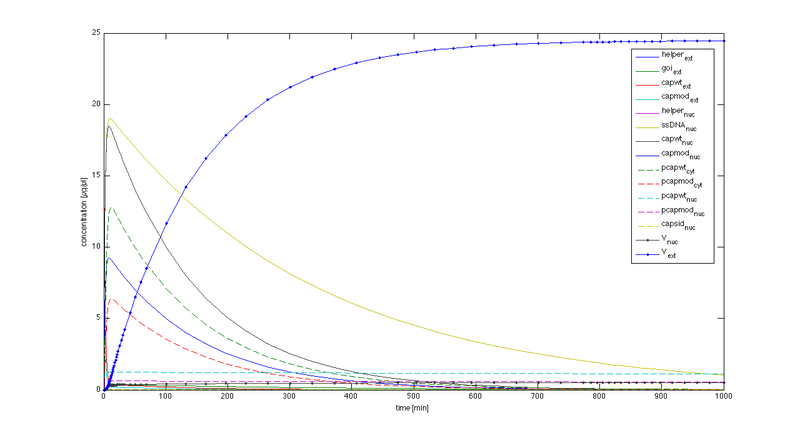 Figure 6: A: Enzyme concentration depending on different degrees of modification. B: production efficiency as a function of modification degree m.
Fitting the model to the data obtained from the fluorescence experiment was performed by the method of least squares in logarrithmic parameter space. Unfortunately only one data set quantifying the single protein, capsid and virus concentration was availible so that the optimization problem was clearly under-determined and no explicit ideal parameter set could be found without loosing the biological signification. More precisely, the data was fitted by an exponential increase while the biological system is expected to saturate for large time values because no more virus is poduced if its plasmid are completely degraded. Figure 7 shows more realistic model characteristics. The blue line represents the sum of all concentrations containing mVenus and the red dots describe the mVenus intensity data set. Thereby the desired simoidal shape was achieved though the chi-square value and consequently the quality of the fit is not optimal. In order to improve the predictive capability of this mathematical model one has to perform further adjustments and more experimental data is needed accordingly. Figure 7: Data fitting approach. The model can be fitted perfectly to the data (not shown) but is not meaningful in a biological sense because exponential increase does not occur in this system. 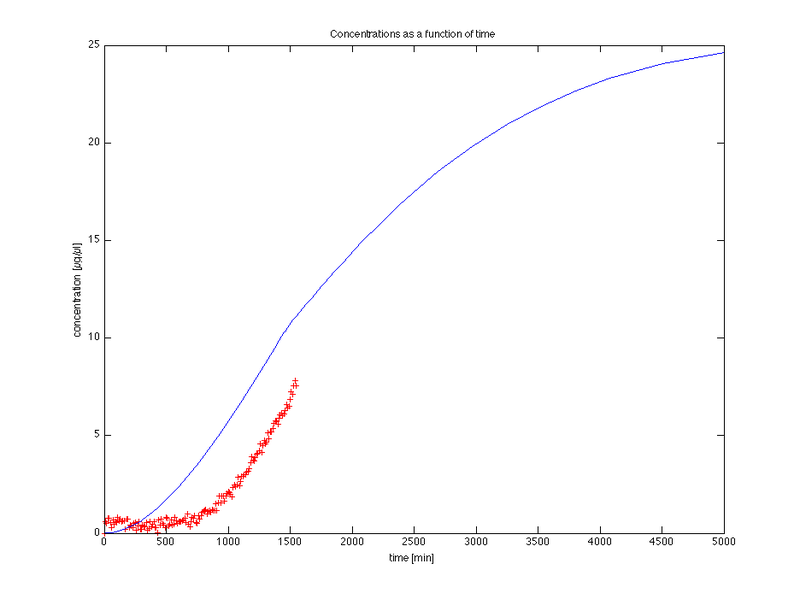 Considering the fact that virus concentration should saturate a sigmoidal shape is expected. Such a fit was not achieved because to many unknown parameters for one single data set.